Arson: A serious crime with serious penalties. | Yavitch & Palmer Co., L.P.A. Arson: A serious crime with serious penalties. Types of arson charges in Ohio and their penalties. Arson is a very serious and, unfortunately, common Columbus crime. For example, Franklinton — on the West Side of Columbus — was recently home to an early morning fire that severely damaged a Buddhist temple. The blaze was first reported around 4:30 a.m. on Sunday, Jan. 31, at the Karma Thegsum Choling temple. And Columbus fire officials almost immediately declared the fire appeared to be arson. This came about a month after a man was charged with aggravated arson in a massive fire that destroyed a 189,000-foot warehouse on the West Side of Columbus. And before that, a Gahanna man was charged with aggravated arson in an incident that left his ex-girlfriend badly burned. The penalties in Ohio for arson-related crimes vary widely. If you are facing arson charges, you’ll need the advice and counsel of the Columbus criminal defense attorneys at Yavitch & Palmer. Arson Defined: What is arson? Arson vs. Aggravated Arson: What is the difference? The difference between arson and aggravated arson is simple. A charge of arson is a 1st-degree misdemeanor in the state of Ohio, although that becomes a 4th-degree misdemeanor if the total property damage tops $1,000. However, if the charge is elevated to aggravated arson, you’re facing a 1st- or 2nd-degree felony. The difference is this: If the alleged arson involves substantial risk to anyone other than the person who set the fire (including any firefighters who battle it), it becomes aggravated arson and a 1st-degree felony. And if the fire involves a building that is occupied at the time, it becomes a 2nd-degree felony. Murder and Arson: What if someone dies during a suspected arson fire? If an arson results in the death of a person, the arsonist is likely to face a charge of murder. That obviously includes someone who was inside the structure when the blaze was started, but murder charges can also be levied if a firefighter dies in the act of battling the blaze. Arson Suspected, but not Proven: What happens if a fire is suspected to be arson? Arson investigators are employed by various state, local and federal agencies to determine if a suspicious fire was intentionally set. This task can be a difficult one, as the fires will typically destroy much of the key evidence that could be used to find its origin. Arson investigators will employ so-called “fire science” to make their determinations. Unfortunately, like any science, fire science isn’t perfect and is constantly evolving, a fact that can result in people being wrongfully convicted of arson charges. The Penalties: What penalties will I face if convicted of arson? Since the severity of arson charges varies by case, so does the severity of penalties, but a felony aggravated arson charge could bring a jail sentence of six months to five years or more, as well as significant fines. In addition to the fines you must pay the state, a person convicted of an arson charge also may be sued by an insurance company to recoup the costs of their payout. And a judge may also force you to pay for the costs of battling the fire. Furthermore, under a state law that took effect in 2013, anyone convicted of an arson crime is required to register annually with the sheriff in the county in which they reside. Call the Experts: What do I do if I’m facing arson charges? 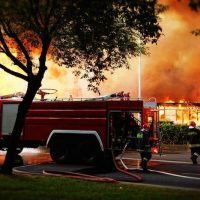 Arson cases can be highly complex and require the advice of experienced Columbus criminal defense attorneys who know Ohio law. If you need to consult with an attorney on your case, contact Yavitch & Palmer today at 614-224-6142.